to understand what behaviors are expected of them. how to succeed in the classroom. to reflect on those behaviors during class time. Students can refer to the checklist throughout classroom work to check in on their organizational skills, state of regulation, focus, effort, and behavior in class. Print it out full size, half page or 4 to a page. Review the checklist and expectations with the student. Confirm understanding of the student. Provide the student with the checklist for during class time. The student can write his/her name and date at the top. 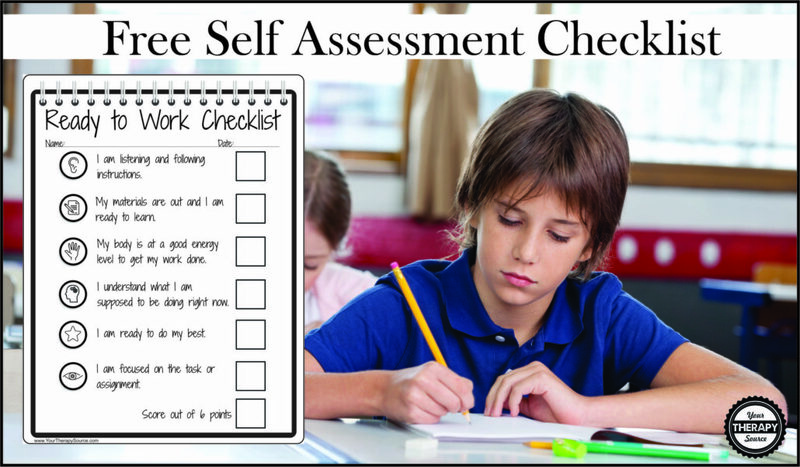 The student can periodically refer to the checklist to self check and confirm he/she is ready to work. The student can put a check mark in the box if the reminder is being accomplished. When the task is completed, the student can record his/her score out of 6 points. BONUS – student generated data collection on his/her goals! Enter your email below to download the FREE Ready To Work Checklist. 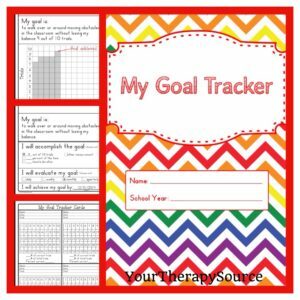 The student can keep track of the data using My Goal Tracker. This is an electronic book of data collection forms for students to track their own progress. The student can track his/her goals over time, by monitoring the skills over the course of a day, week, month or quarter. Find out more information. 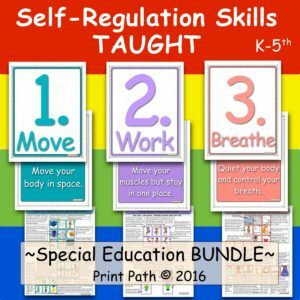 Move~Work~Breathe is a self-regulation curriculum designed by a school based occupational therapist, Thia Triggs. This curriculum provides an effective, time-efficient structured system to provide classroom breaks, improve self-awareness and self advocacy and teach specific self-regulation skills so that kids have tools to use in their classrooms. This system will get kids moving, give them the benefits of a brain power boost [from getting their heart rate up], give them heavy work and isometrics to help them calm down, and help them learn techniques to quiet and control their bodies in order to return to their academic work. FIND OUT MORE.